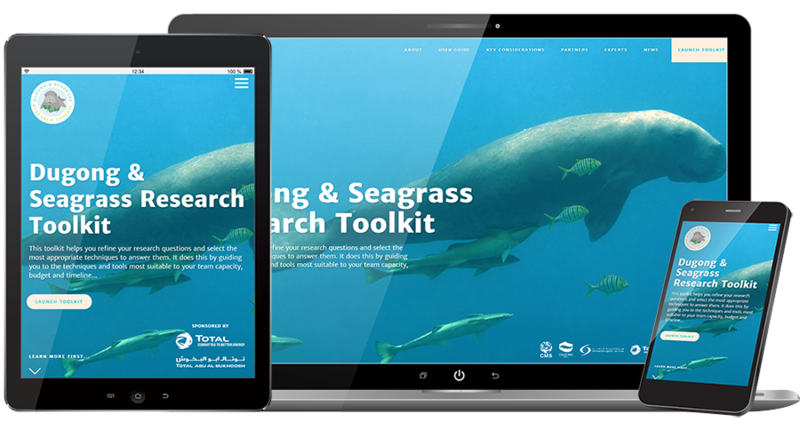 The Dugong & Seagrass Research Toolkit aims to protect dugongs, conserve seagrass, and facilitate change in the communities that share their ecosystem. 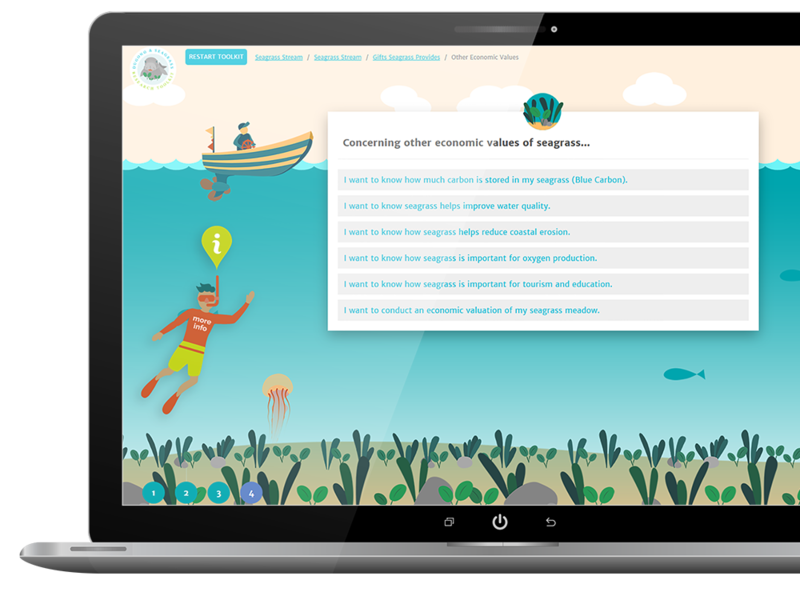 The toolkit helps users refine their research questions by asking what information they need and why they need it. Its show them which techniques are the most suitable for timeline, team capacity, and budget. 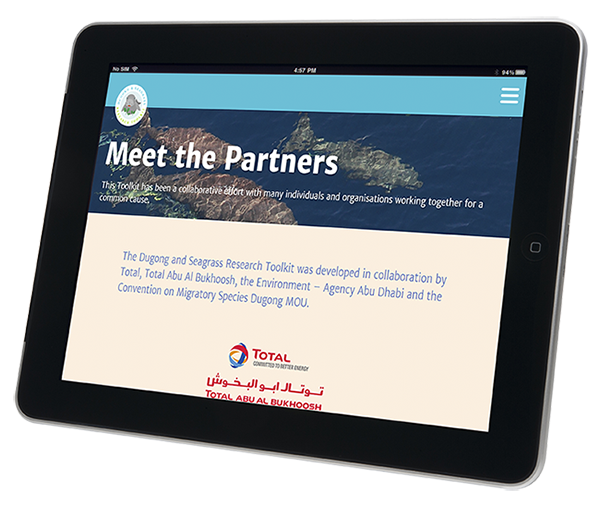 With funding from Total, coordination by The Convention on Migratory Species (CMS) and facilitation by The Environment Agency – Abu Dhabi (EAD); we were tasked with developing a toolkit that aids the conservation of dugongs and seagrasses which are under threat from human activities. 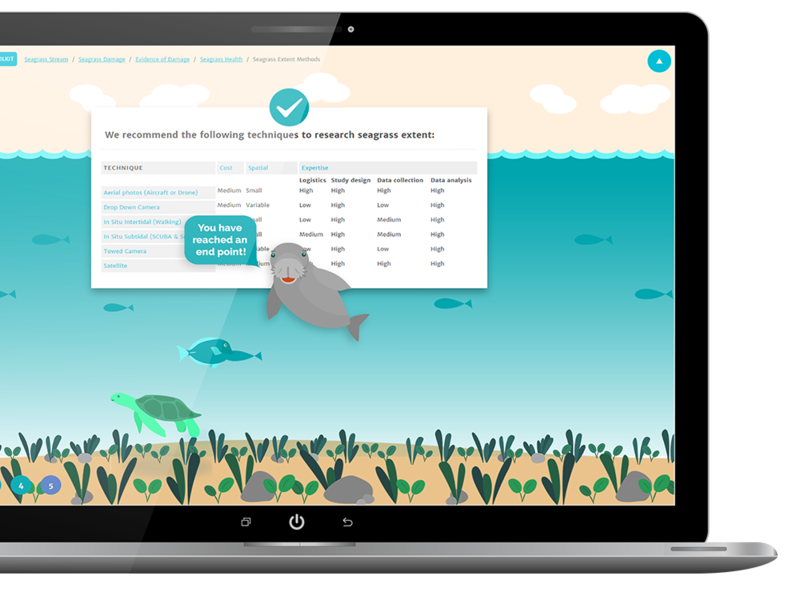 The toolkit would be for use by marine natural resource managers and decision-makers (government and non-government) as well as for dugong and seagrass researchers. A key aim was to guide users to the most appropriate tool or technique given their unique situation, and to answer their research question. An additional outcome of the toolkit is that it assists organisations to assess funding proposals by describing the scope of work, choice of techniques and tools, and budget. Communities are important partners in dugong and seagrass conservation, and this was a focal point identified from the outset. The aim of the toolkit was to enable visitors to firstly understand better the status of dugongs, seagrass and communities at research sites. In addition to assess the threats to dugongs and seagrass and help find solutions to those threats. 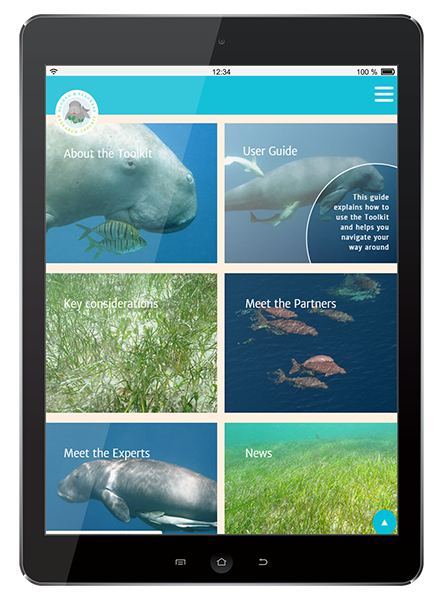 Finally they wanted users to appreciate the communities that value or may impact dugongs and seagrass. 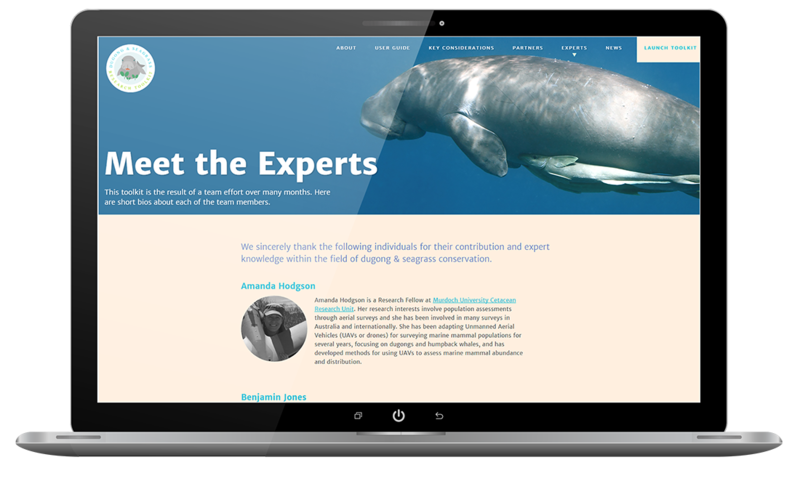 With an incredible team of conservationists in place, we utilised their wealth of experience and knowledge to create an interactive online tool. The toolkit and associated website was launched on 13th March 2017 at the Third Meeting of Signatories (MOS3) to the Dugong MOU. The launch was followed by a technical workshop that involved training users that would be using it to undertake the relevant techniques and methods they are guided to in their field work. The toolkit received a very positive response with participants appreciating the knowledge they now have access to. It is currently being utilised by teams across the Indo-Pacific region in their important work. For us it was a great opportunity to meet users, receive their feedback, and then implement suggestions to make further interface improvements. This was an unusual and interesting project to work on due to the sheer size and differing time zones of all those involved in producing the end product. The team consisted of conservation experts in America, the Middle East, Asia, Australia, and the UK. Prior to our involvement much of the structure had been defined, notably that there would be three streams involved; Dugongs, Seagrass, and Communities. We were therefore introduced to key contacts from each of these streams and along with a central management team in Abu Dhabi, collaborated over several months to develop the toolkit. Thankfully we were able to meet face-to-face for several days in Thailand a couple of months before the launch. We prototyped a version prior to this meeting that helped formulate ideas amongst everyone involved. With an action plan in place it was down to some programming and design to develop the toolkit. Whilst the toolkit was built as a WordPress plugin we wanted to implement best practice methods to store and organise the related data across the six database tables it required. We therefore set about creating an object-oriented database abstraction layer to keep all the bespoke data outside of the WordPress architecture. Partly, the aim for this was to make the direction for further development flexible so that it can be ported to any framework. Having looked at other conservation tools, we wanted to develop something that was simple and fun to use as well as be visually appealing. Of course it had to fulfil the educational conservation goals but that was the work of the experts. Essentially our role was to bolt together the knowledge of others and deliver a final product. Intex Digital were fantastic to work with – they were able to conceptualise a Toolkit that we could barely articulate in the beginning. Paul took on board all of our ideas and worked with our dugong and seagrass technical team to ensure the Toolkit was exactly what we wanted it to be. The Toolkit is a fantastic resource for conservation and it wouldn’t have come together without Paul and all his hard work – especially in the lead up to the launch. We highly recommend Intex Digital and would use their services again if the opportunity came up! We're passionate and motivated by the great work you do! Like what you see? Are you involved in species conservation?